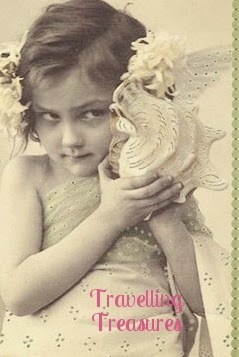 Sweet Little Cottage: Travelling Treasures, etc. Do you remember Travelling Treasures? I started this as a bit of "pay it forward" after I won "Tuesday Treasures" over at Melody's place. Melody sent me a pattern along with a few other goodies. After I made the pattern, I knew if I wanted to make it again, I would remember by looking at the one I made. Instead of filing it away, TT was born. I offered a giveaway for the pattern, along with another one, and some other goodies. This parcel is meant to go to a new person every month. get the fun going again. It's really easy: the parcel will contain a combination of fat quarters, patterns, and some extra goodies. If you are the winner, you choose what you want to keep, add a few goodies, arrange your own giveaway, and pass it on. There is a notebook in the parcel for you to sign. You can do a random giveaway, or a guessing game. I will be posting a guessing game question sometime before next Tuesday. It's easy to play along, so I hope you will be watching for the question....Due to postage costs, this giveaway is limited to Australian or New Zealand residents only. I am counting the sleeps now until Boy 14 comes on Friday morning. He is probably between 8-10 years old, which is when the working dogs are retired. He might be here a week, or months. He will stay with me until his adoption to his forever home. He is #14 foster pup for me. He is also by far the LARGEST one I have ever had...think baby cow size LOL. The lady rang me last night and she hasn't met him yet either, but she told me his weight...which is more than half of what I weigh! I had a bad reaction to a new medicine I started last Monday. I stopped it on Friday and I finally feel ok now. I still managed to sew a tiny bit the past few days. My stitching group row for the row along quilt theme for this month is hexies. I can't show you anything yet until the quilt top is done as we are all sworn to secrecy until then. The rows are only 5 1/2 inch wide and the design I want to make takes 23 hexies... plus extra on either side. I am using 1/2 inch hexies...still enjoying so far!! I've had apples on the brain for ages and I've made a start on my next baby quilt. The basic design is snowballs made to look like apples, then I will applique the leaves. I managed to get 11 of them to the snowball stage before I ran out of squares for the corners. Each one takes four 1 1/2 inch squares. Last, I am still seeking donations to help a charity group. Perhaps you can spare a moment to make a little drawstring memory bag or two, or some nursing pads? The donation box will be passed on 20th of July, so there is still time to help these volunteers. I sent them two pairs of premmie pants last week and they have posted on their facebook page that one pair is on the way to a 32 week prem bub in Tasmania. I was wondering where TT was...23 half inch hexies...now there's a challenge!! Travelling treasures is such a great idea, so glad you have it back. lots of different things happening over at your place.... no sitting still for you I imagine?